Growing up in the sleepy little surf town of Carpinteria, just south of Santa Barbara , my first step on the path to becoming a winemaker had little to do with grapes, wine or my proximity to the now-famous “Sideways Country.” It began with gardens. I planted my first herb garden when I was about 11 years old because I was fascinated by the natural aromas that plants had: how they got in there, how they developed and why they smelled so wonderful to my curious nose. As I got older, I began smelling not just the lavender and jasmine in my mother’s seaside flower beds but also the glasses of Santa Barbara County wines my parents passed around the table while dining al fresco with friends. As I learned about chemistry in high school I began to understand that some of the same exact components that create delicate aromas in a flower or citrus zest can also be naturally present in grape skins. When carefully tended by a skilled winemaker, these same perfumes can be captured and transferred from grapes into the finished wine. This weekend in Santa Barbara County, in Buellton to be exact, hundreds of wine bloggers will descend upon this quiet corner of the Central Coast and for three days will taste, tweet and network during the annual Wine Bloggers Conference. Though wine will no doubt steal the aromatic show, via thousands of nose-in-glass selfies and group pictures with bottles, I would like to invite my fellow conference attendees to stop and smell something other than the Pinot. The Central Coast has an amazing array of natural aromas to enjoy that, like its wines, are truly an expression of its “sense of place.” Below are some of my favorites from growing up in Santa Barbara County. From the hillside chaparral and the eucalyptus stands to the hedges of jasmine downtown or the salty-tar tang of the seaside, here is a collection of sensory souvenirs that can be just as intoxicating as the region’s fine wines. 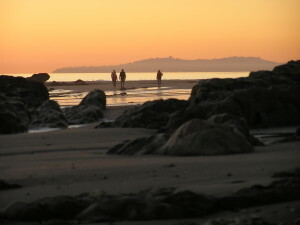 Oranges and lemons have long been grown in Santa Barbara County and citrus groves dot the hillsides up and down the coast along Highway 101. 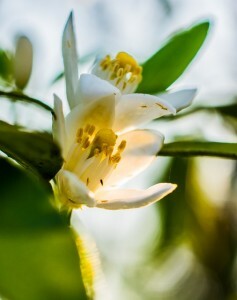 If you can (safely) pull over on a back country lane or at a winery rancho, be sure to bury your nose in some of these zesty and unforgettable blossoms. 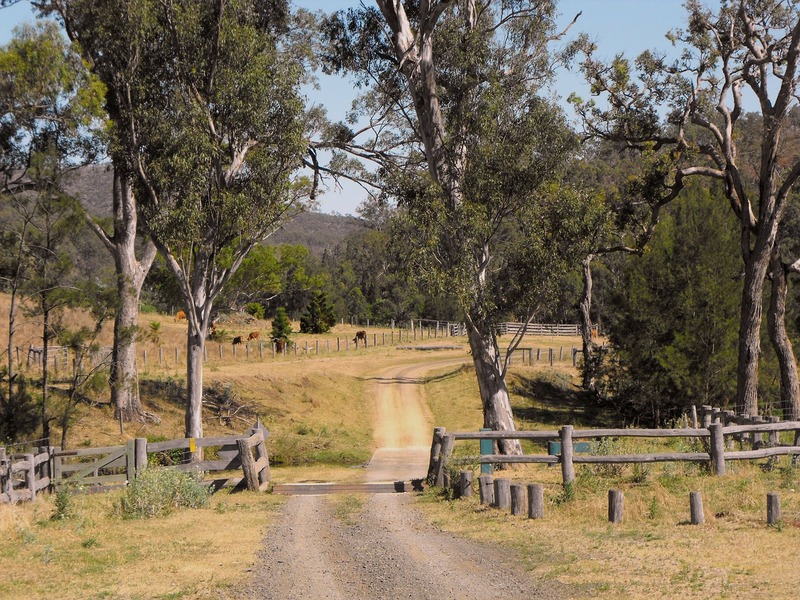 Not native to the Central Coast, eucalyptus trees were imported in the 1800’s primarily as windbreaks and as a source of wood. They quickly took root and their minty herbal smell, whether wafting through the wind or released from leaves crushed underfoot, is a Santa Barbara county scent signature. 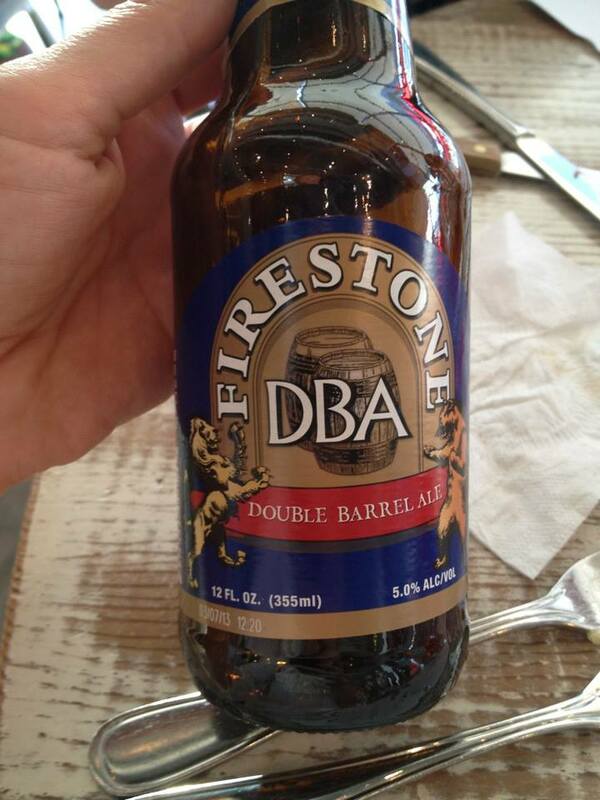 Our home-grown beer isn’t as world-famous as our wine, but Firestone-Walker Brewing Company and Carpinteria’s own Island Brewing Company are starting to change that. Interestingly, the Wine Bloggers Conference home base, the Santa Ynez Valley Marriott, is just steps away from the Firestone-Walker Brewery so this is one Santa Barbara scent that, depending upon the time of day and the batch brewing at the moment, my fellow bloggers should be able to enjoy. Dating back to the simple culinary days of the Spanish Californios and the Mexican rancheros, Central Coast (sometimes called “Santa Maria Style”) BBQ is unique in the United States. No sticky-sweet barbecue sauce is allowed. 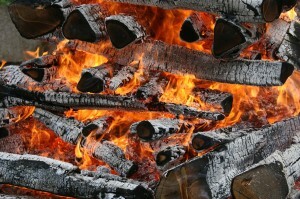 The only fuel employed is local coastal live oak. Salt, and sometimes pepper and garlic powder are the only seasonings. Sound boring? Smell for yourself. Author Rex Pickett probably had booze rather than geography in mind when he came up with the book and movie title “Sideways,” but I’ve got my own more local explanation. Santa Barbara County’s coastline is unique in that it runs in an east-west direction as opposed to the traditional north-south orientation like the rest of the state. This “sideways” effect creates east-west valleys that reach from the ocean into the warm interior, enabling cooling fogs to roll into the vineyards during the evenings. Fortunately, for winemakers and wine lovers, this helps create ideal conditions for producing great Pinot Noir, Chardonnay, Syrah and other fog-loving varietals. Watch your step though; The beaches of the Central Coast sometimes harbor bits of tar, products of a naturally occurring petroleum seepage just offshore. If you’re at a winery close enough to the ocean sometimes this fog brings a little bit of a salty, tarry tang to the air with it….but I recommend actually getting to the beach if you can. 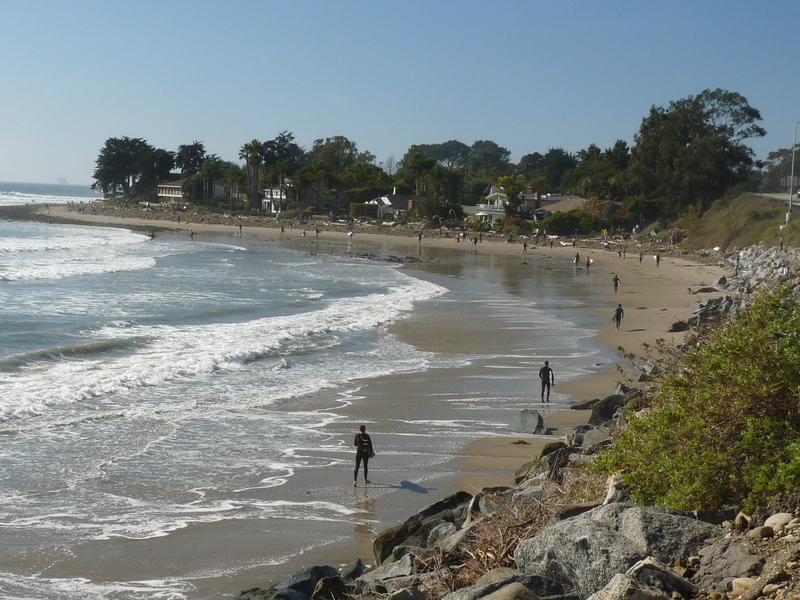 Luckily Gaviota State Beach is just a few miles down Highway 101 south of Buellton. Though she lives in Napa today, Alison Crowe is a Napa-based consulting winemaker and a native of Santa Barbara County. She is excited to attend her first Wine Bloggers Conference this weekend as a Wine Blog Awards finalist for “Best New Wine Blog” and to meet up with old friends and new. 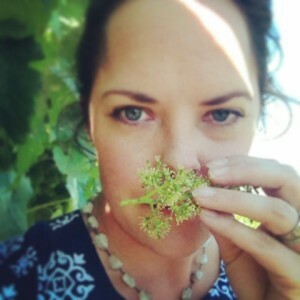 What does a vineyard smell like? If you’re fortunate enough to be around vineyards in the middle of Spring, you might find out if you can catch the vines when they’re in the midst of that fleeting week or two called “Bloom.” This is when the developing grape clusters actually flower, get fertilized and begin their true journey to become this harvest’s grape crop. 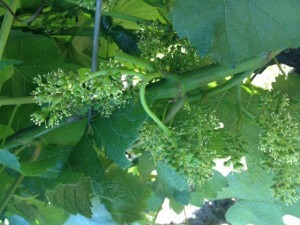 Some express surprise that grapes actually flower. It’s not perhaps the most glamorous part of the wine year, and certainly never seems to get much attention in the media. Indeed, it is probably one of the quietest times of the growing season. The pruning crews are long gone and the tractors have done most of their post-winter tilling. The danger of frost season is largely over. Harvest is still many long months away and winemakers have their heads buried deep in their barrel stacks and their bottling lines. Attention is focused elsewhere. In the meantime, screens of vine leaves obscure the drama quietly unfolding underneath. Push aside a saucer-sized leaf and you’ll reveal a thumb’s length of yellow-green nubs, each crowned with a tuft of cream-colored threads. 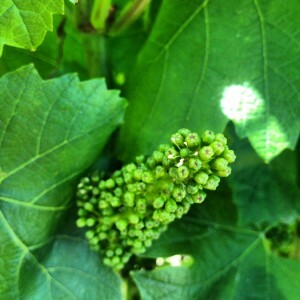 Carefully wave away the drowsing bumblebee and bury your nose in the soft texture of the developing grape cluster. Inhale. Until the grapes are crushed and fermentation begins, this is the only time you’ll be able to immerse yourself in the scent of a grape. 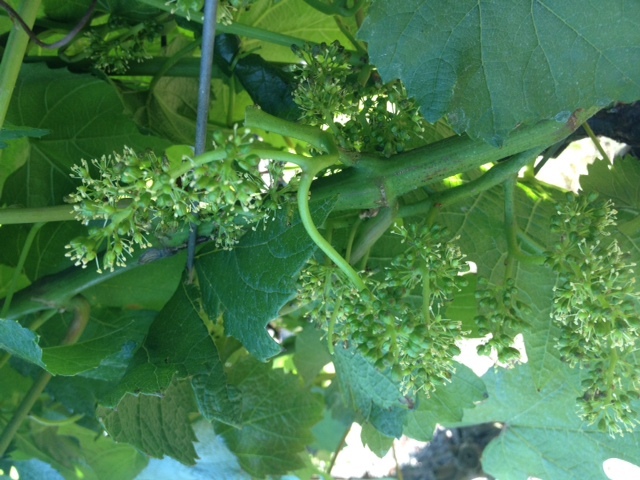 Flower petals look like tiny cream-colored threads atop what will eventually become each individual grape berry. So what does a vineyard smell like? Stanly Ranch Pinot Noir, at 10:01 in the morning on May 1, 2014 smelled like the skin of a sun-warmed D’Anjou pear, the flesh of a fuji apple and a slice of a barely-ripe honeydew melon. 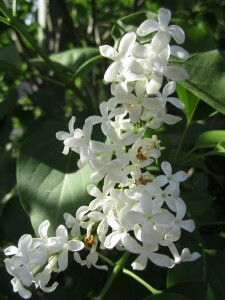 The aroma of a blooming grape cluster is sweet without being cloying and like the scent of violets, is ephemeral and doesn’t satiate. It’s impossible to stop sniffing because the aroma of Bloom, like the time of the year itself, is subtle, beautiful and fleeting. Alison Crowe is the Winemaker at Garnet Vineyards and is fascinated by the world of scent and loves how aromas stir our memories and touch our souls. Like this blog? 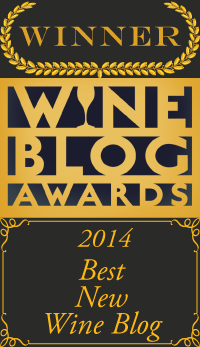 Nominate me for “Best Winery Blog” in the 2014 Wine Blog Awards!